Pretty Little Liars, I. Marlene King’s moody, dark fever dream of a teen murder mystery, will air its final episode tonight. After seven long years, faithful viewers who’ve stuck with it through plot twists, lingering questions and infuriating red herrings will finally be rewarded with the answer they’ve been waiting for since the end of the first season: Who is the evil mastermind behind the emotional and physical torture wrought upon the liars, and what are their motivations? For those unfamiliar with the show, here’s a brief summary: Aria Montgomery (Lucy Hale), Spencer Hastings (Troian Bellisario), Emily Fields (Shay Mitchell) and Hannah Marin (Ashley Benson) are four best friends who, at the show’s start, are finally free from the mean-girl machinations of Alison DiLaurentiis (Sasha diPieterse), a close frenemy who has died under mysterious circumstances. Ostensibly, they’re trying to figure out who killed Ali and why, but that mystery is eclipsed by so many others, all of which are spearheaded by a group of entities known alternately as “A,” “Red Coat,” “the A Team” and finally, “A.D.” Over the years, the enemy has used a variety of intimidation tactics, ranging from threatening group texts to technologically enhanced board games that tracked the crew’s every move. The Liars—all of whom are exceptionally bad at lying—were once trapped in a warehouse somewhere on the outskirts of town, where each girl was trapped in a replica of their own bedrooms and subjected to psychological torture. Seven seasons and one five-year jump in time later, the final season of this show finds the Liars older but not an ounce wiser. Set in Rosewood, a fictional suburb of Philadelphia where it is always autumn and the dead usually end up being alive, PLL introduced four archetypal characters—the nerd, the jock, the ditz and the artsy one—and then proceeded to dismantle those archetypes, allowing each the space to evolve that only a 22-episode season of television can. In doing so, Pretty Little Liars upended the thematically similar narratives of past television teen dramas. Dawson’s Creek focused on interpersonal relationships and romance, but never ventured into the dark and deranged territory PLL explored. A close relative, Gossip Girl was acerbic and risqué, but steered clear of most of the types of plots that would come to define PLL, such as murder, surveillance, and covert IVF. Veronica Mars shares the most creative DNA with the the show—both are mysteries, but Veronica Mars is tame in comparison to the hell the Liars have been through. 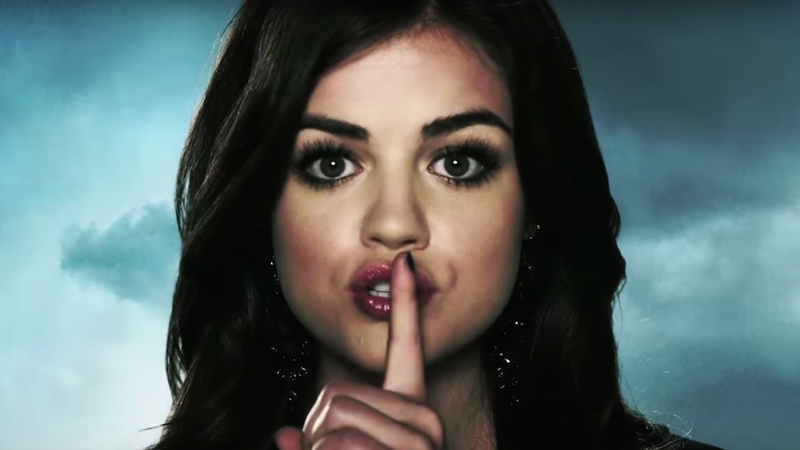 When Pretty Little Liars premiered in 2010, it brought with it a fresh template. An early review of the series in the A.V. Club compared it to Desperate Housewives, a soapy show clearly targeted towards adults. Writing in the New York Times, Gina Bellafante noted that “any series about teenagers that imagines a world without vampires feels like remarkable cultural progress.” Vampires, not psychopathic stalkers obsessed with surveillance, were the rage at the time of the show’s premiere—an interpretation of teenage alienation that portrayed the outcasts as literal fantastical beings. The Vampire Diaries was in its second season when PLL premiered and True Blood and Twilight commanded national attention; in each, a feisty mortal woman entertained two supernatural lovers, and those love triangles were the beating heart of each narrative. PLL isn’t the first show to dispense with that kind of relationship as a storytelling device, but what has carried the Liars throughout the mayhem they’ve endured for seven years is their everlasting commitment to ride or die for each other. Riverdale is the current show that owes most to Pretty Little Liars, both thematically and visually. The dark and gritty reboot of a beloved and wholesome comic bears little to no resemblance to the source material; the characters are the same, but the plot of the first season feels indebted to the path the Liars paved. In Rosewood, as in Riverdale, the sun rarely shines. Parents will disappear for entire seasons while their children skulk around on empty street corners and disappear behind hidden doors. On Riverdale, it’s too early to tell whether or not the parents will stick around for long, but if the show hews to the standards of the genre, they will soon disappear—gone on business trips that last for two seasons (or, in the case of Ali’s mother Jessica on PLL, murdered by her twin sister and buried in a shallow grave). Absent from Riverdale is an omniscient villain. The Liars live in a terrifying surveillance state, the workings of which demonstrate a laughable and puzzling understanding of how modern technology works. Under constant watch, the Liars are never able to get ahead; they are entirely complicit in the web of secrets and lies that their assailant holds against them. Riverdale’s central mystery is slightly more realistic and certainly easier to understand, though making that assessment is premature. There’s still time for the show to dispense with any semblance of reality and lean in to the camp. At the heart of all teen dramas is the frothy mix of emotions bubbling just beneath the surface. Adolescence is slammed doors and texting at the dinner table, ignoring your parents in favor of over-analyzing social interactions and keeping up appearances. Being a teen is hormonal, brooding torture, but it can be devastatingly boring. Pretty Little Liars considered the particular ennui of life in a small town and injected some excitement and illicit thrill, and created a blueprint for other shows to do the same.